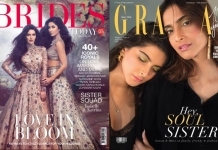 Grazia’s June edition is all about high-street fashion and for their cover, they dressed their models in some high-street clothes for one high-impact cover. We love the mood of the cover. Do you? P.S: The models are in Zara, Mango, Espirit and Vero Moda. Oh yes the cover and the style of the shoot is fabulous. 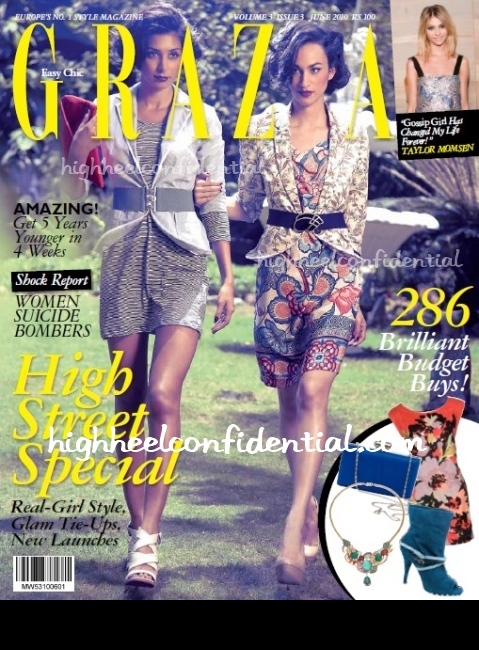 However the position of the name ‘grazia’ is so distracting?? Nice……is the dress on the right by Mango? The print looks alittle like the top Dia Mirza is wearing a few posts back. Love the retro look and contrasts in styling. the model on the right just looks like part of the garden. it’s a bit painful to the eyes if you ask me. Can’t wait to get my hands on this issue…..looks really interesting….absolutely love what the models are wearing…..
Why are both models styled so similarly? Belted jacket, short dresses and same hair? With two models on the cover there was so much scope!